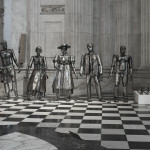 ‘All the World is now Richer’ is a sculpture to commemorate the abolition of slavery. The sculpture hopes to show that the people of slave heritage are brave and have dignity and strength. The vertical component consists of a line of life- sized figures representing successive stages of the slavery saga. Thus the line starts with a figure clad in indigenous robes. Then come two figures representing trans-Atlantic slave labour: a plantation worker with a machete and a domestic serving woman. 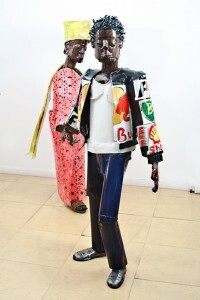 These are followed by three figures representing the post- liberation era: a Sierra Leonean woman in nineteenth –century Creole dress, a man in a twentieth century executive suit and finally another relaxing in casual trousers and a tee-shirt. The literal component consists of phrases referring to the stage in the saga represented by its corresponding figure. A chance to show these figures in the Great Hall at the Houses of Parliament, during President Obama’s visit, would show the role the Houses of Parliament have played through world history. 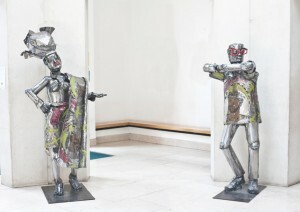 This sculpture has been exhibited in the House of Commons, Bristol Cathedral, Norfolk Cathedral, and St Paul’s Cathedral. It toured from 2010-2014.